Creating a blog is VERY easy these days. This fun, fast 'how to start a blog page' tutorial shows you the easy, no-hassle way to make your own blog. If you made it to this web page you have the skills to build your own blog site. Wordpress is the best blog software out there. Almost every blog today uses it because it will easily let you do everything you want to do when you build your own blog. I recommend Act Now Domains for Wordpress web hosting. They are great, easy, and cheap. Plus, they have excellent support. It's who I use for my stuff. Watch the videos below then go to step 2. You want to go with a web host that not only offers an easy install of Wordpress. You also want one that will help you if you need help. The Wordpress Web Host I recommend is Act Now Domains. They have been in business since 2001, have great support and it's who I use. Setting up your blog account with your Wordpress web host is very easy - you just follow along the prompts they give you (ex: username, password, etc. ), but check out the short video below for a couple of things you may find helpful to know when you set up your account. Now it's time to get to the fun stuff. The next part of the creating a blog process is to choose your blog design (which is called a "theme" by Wordpress.) There are thousands of free Wordpress themes to choose from. There is no reason to pay for one unless you just really fall in love with one that costs money. The most popular place to get a free blog design is the Wordpress Themes Directory. This place has over 1300 free designs to choose from. What's great about using Act Now Domains for your blog host is that you can access the Wordpress Themes Directory directly from your blog with their system. When you find the one you want to use, just click a button and their system will automatically install your new design for you. Their system makes getting a design super easy and saves you the time and hassle of downloading a design to your computer, uploading it to your blog and installing it yourself. Just click a button and the design you want is there! This is part is the most fun. 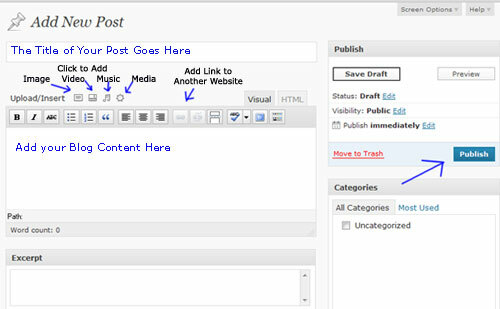 You simply enter the text, images, videos or whatever else you want to add when you build your own blog. It is very easy to do this part and is very intuitive. The Add a Post screen on your blog is a lot like the screen you see when you send and email with just a few changes that I've noted below. When you're done just click the Publish button. It's really easy! Want to add some really cool features or neat gadgets to your blog? You can through the use of plug ins! A plug in is just a mini-program that can enable your Wordpress blog to do almost anything you want. A fantastic resource to use is the Wordpress Plug Ins Directory. It is totally FREE and provides access to over 13,000 cool plug ins that you can add to your blog page. Like the designs, if you use Act Now Domains to host your blog you can browse the Plug Ins Directory directly from your blog page, click a button and their system will automatically install the plug in to your blog. This will save you a LOT of time and hassle! That's really all there is to creating a blog. It is very easy and so simple that a beginner can make an amazing looking blog in very little time. If you ever do need help and Act Now Domains is your blog web host just give them a call and they will help you. Congratulations! You now know the answer to the question "How do I Start a Blog Page? and can quickly and easily create your own blog today! Click here to get started.